Criticism didn't really stop us and it shouldn't ever stop anyone, because critics are only the people who can't get a record deal themselves. I don't have any desire to learn. I feel it's like a voodoo, that it would spoil things if I actually learnt how things are done. Lovely Rita, Meter Maid, nothing could come between us. For cruelty to animals, vegetarianism is the great thing to get rid of that. For the planet, to prevent depleting the water and the land and everything, it's a great idea. And I think it's a great thing for your health, and doctors nowadays agree with that. There are plenty of great books and organizations, so no matter where you are, there is someone to help you. That's your first step, and I think your second step is just look in the supermarket for good vegetarian food, and I think it's so much more readily available now. I'd like to be able to go on holiday and not to have to hold my belly in for two whole weeks. With life and all I've been through, I do have a belief in goodness, a good spirit. I think what people have done with religion is personified good and evil, so good's become God with 'o' out, and evil's become Devil with a 'd' added. That's my theory of religion. I really wish the people that look sort of in anger at the 'weirdos,' at the happenings, at the psychedelic freak-out, would instead of just looking with anger, just look with nothing; with no feeling; be unbiased about it. They really don't realize that what these people are talking about is something that they really want themselves. It's something that everyone wants. You know, it's personal freedom to be able to talk and be able to say things And it's dead straight! It's a real sort of basic pleasure for everyone. But it looks weird from the outside. In one old people's home they changed the words of the song to 'When I'm 84' as they considered 64 to be young. I might do that. We probably seem to be anti-religious... none of us believes in God. Personally, I think you can put any interpretation you want on anything, but when someone suggests that Can't Buy Me Love is about a prostitute, I draw the line. That's going too far. 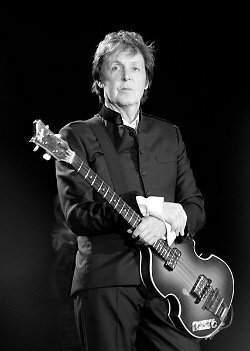 Bio: Sir James Paul McCartney is an English singer-songwriter, multi-instrumentalist, and composer.